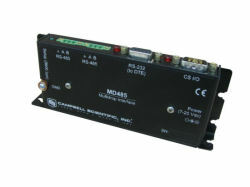 The MD485 is an intelligent RS-485 interface that permits a PC to address and communicate with one or more dataloggers over a line distance of up to 4000 ft. This interface also supports datalogger-to-datalogger communications, callback from a remote datalogger, PC-to-printer communications, and CC640 digital camera-to-datalogger connections. PC400 or LoggerNet software is used to initiate and control the communications link.